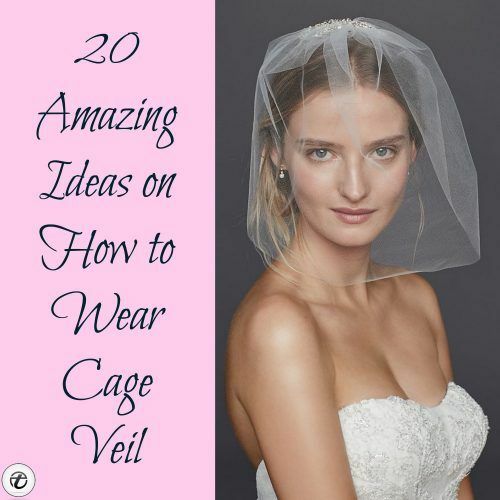 Cage Veil Ideas- A considerably charming and vintage escape from the traditional and contemporary cathedral veils which were often shoulder-length; birdcage veils exhibit sophistication and luxury along with a cherry and playful touch. The 1950s and 1960s veils were all about simplicity and lace along with precise length and needlework. Contrary to this, the modern caged veils are all about luxe embellishments and unique shades. Also, these modern bridal or party accessories involve raw ends and are often made of tulle net. Looking at the caged veils from Greek’s point of view, it saves the bride from all kinds of evil while during the Medieval times it was considered to be a sign of purity and chastity. Hence the modern bride is, no matter what, fond of this enchanting wedding accessory as it is well-known that the more conventional it gets, the more beautiful it looks on the big day. Also, these beautiful pieces will further enhance your hairstyles by adding a touch of festivity to them. A veil is often considered to be old-fashioned among the modern brides but by the end of the wedding shop, most of the brides realize that it is one essential item that will give them the ideal divine look. 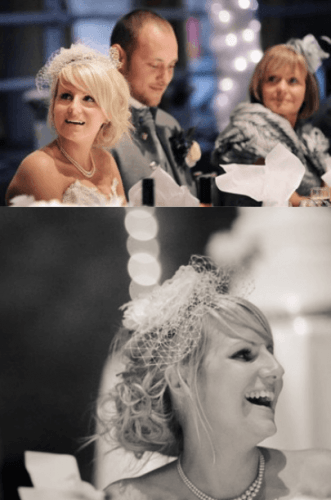 The ladies who are planning to pick a caged veil for their cousin, sister or bestie’s wedding or before ceremony party, as well as the brides-to-be, will find this article to be extremely helpful as it will provide you with some of the most elegant and unique ideas on how to wear a birdcage veil on the big, festive day, relieving you the pain of going through a large number of veils at various boutiques. Now, you can make a birdcage veil at home as you like with a just a few items like a small metal comb, two net pieces each 3 inches long; one with small and the other with big holes and finally, some lace or other embellishments as you desire. Cover the comb with a 2-inches long tulle with smaller holes and later attach it to the 3-inches longer one, which has bigger holes, with a white thread and needle. Also, make sure you have cut the front two corners making them looking neat and rounder. Attach the lace with some hot glue such that it covers the comb, giving you the desired look while costing you a fair fortune. There are a number of brides who want something in their hair while the entire ceremony and during the evening dinner as well, however, most of them find the veils hiding their face quite irritating. The point is what to do in such a situation where you are indifferent between wearing the veil or getting rid of it. The answer is too simple, tuck your bandeau or inga veil in the form of a luxe fascinator in the back of your hair or underneath with the clips after the ceremony so that your eyes are on point and hair are further beautified. Here’s an awesome guide on What to Wear on Bridal Shower? ↓19- How to Wear a Cage Veil with Short Hair? Short hairs are relatively easy to style using a bandeau or blusher veil. Just add some waves to your short hair or straighten your hair with a few twists or braids on one side. Simply pin the veil on the opposite side of the braids and add a fascinator for elaboration. ↓18- How to Wear a Cage Veil with Long Hair? Long hair often looks good with Cathedral caged veils embellished with laces, however, you can go for simple waves for a humble flowy look. Ladies who like tied hair have a number of ways to style their hair. With some teasing at the front and a side bun with a messy look can be added along with a birdcage veil that covers the forehead only. A sleek ponytail with curled hair and a rosy veil tied at the back of the tail is another elegant option. A bandeau caged veil is the one which can be tied behind each of your ears with metallic pearl embellished clips which look high-fashion on occasions like weddings and reception parties. Also, these are easy to position and do not cover the eyes frequently; rather these elegant pieces only cover the forehead. Do have a look at these 17 Beautiful Kitenge Bridal Design. A piece of tulle which covers only one side of the bride’s or bridesmaid’s as it is placed in an angular position and is clipped at the front looks giving one eye prominence. Vintage veils are often the ones which fully cover your face and add minimal embellishments like pearls or lace. These look exceptional for brides only. Ladies with short bobs can opt for these veils and these are often worn by royals with round hats. Lebanese veils are often longer than shoulders and sometimes floating as well. These are often matched with the wedding gowns and add similar beadwork or embroidery. Flowy or floating caged veils, which are pinned at the back of the head, are royal ones which are the best option for brides who want the conventional cathedral look on their special day. Here are 19 Best Winter Dresses for Wedding. Blusher veils attached with cute pom-pom headbands are a unique option for young brides who want to try something new on their wedding day with half-hair tails and some tease behind the band. A bandeau veil with a lacy floral patch on one side which gives the bride a luxe feeling looks super elegant and modest with a lacy dress. Add a few pearls for extra definition and avoid ear studs or any necklace; keeping it decent and moderate. A floral crown can be tied with a cage bandeau or blusher veil with low or high ponytails as was done in the recent Chanel Spring 2018 Couture show held in Paris. It looks exquisite on themed parties or bridal showers. A sheath or simply A-line gown with no or light embellishment looks exceptional with the Bohemian veil oozing festivity and simplicity as inspired by Kate Moss. Love Boho? Here are 12 Chic Style Bohemian Outfits Combinations for this Season. Teenage girls can opt for caged veils connected with a cute bow on parties and wedding ceremonies for friends and family. A mini-hat in round shape can be connected with big holes tulle fabric that covers the forehead and eyes in a flattering manner. Festivals and funky weddings ask for unique funky accessories which include funky caged veils as well. Multi-color floral veils with patterned tulle can be worn with matching short frocks for a high-fashion look. Celebrities like Kim K and Beyonce are often seen wearing simple veils which cover more than their shoulders while the royals often associate bandeau veils with chic and uniquely-shaped hats. Have a look at these 30 Most Beautiful Honeymoon Destinations of Famous Celebrities. ↓3- How to wear a Veil with Tiara? Just like the Duchess of Cambridge, Kate Middleton, you can opt for a drop veil with lacy borders, covering your entire face and tiara initially with secured pins neatly. Bridesmaids should always opt for blusher birdcage veils which partially cover their faces and a simple fascinator which is more than enough for bridesmaids. A beige dress with multi-color embroidery can be worn with a beige drop caged veil with matching embroidered borders for a unique wedding day attire. Share your views related to these styles in the comments section.